Two weeks ago we met with Craig Middleton, founder of one of Scotland’s newest producers – Cromarty Brewing Co. Highly enthusiastic, Craig told us about all kinds of different projects in the pipeline – but also that he was launching both of his beers (plus a bonus) into Edinburgh on the 17th of February at the Kilderkin. So, of course, we turned up to sample his beer and see what kind of flavours he’s getting into his early offerings. 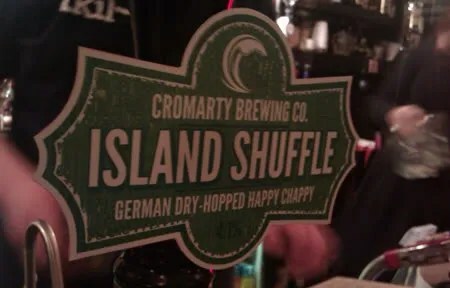 First up was his debut beer, Cromarty’s flagship – Happy Chappy (4.1%). A ‘new wave pale ale’ that has been doing the rounds on the Black Isle, but has only just made it to Edinburgh. A golden session beer, it has a lightly floral nose, with some soft citrus on the flavour. Maybe a touch more carbonation would lift it, but as an initial outing, it shows a huge amount of promise. Next on the list was Island Shuffle, which is essentially Happy Chappy brewed with German yeast, and then dry hopped with Columbus. The difference was immediate – a big lemon zest aroma, then much more bitterness to the palate throughout. The body is slightly lacking for the hop profile – but in a dry-hopped 4.1% beer that’s very often be the case. The zesty fruit flavours definitely make up for it. So Island Shuffle was good, but Brewed Awakening was better. A 4.7% coffee stout, being jet black it looked the business – and also delivered a roasty coffee bean aroma. Coffee on the flavour, with a touch of caramel sweetness, before the bitter roasty finish. Here the smooth body helped, giving the coffee more chance to come through – and in that respect it reminded me of Summer Wine’s Barista – one of the best UK lower-abv coffee stouts. Just had Brewed Awakening at The Guildford Arms. It was lovely. Joins some great dark beers from Scottish brewers. Tempest’s Cresta, Stewart’s Cauld Reekie and Black Isle Porter amongst others.